Retro Moldova Hostel i Chisinau, Moldova: Bestill nå! 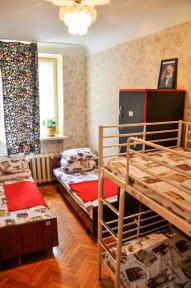 Retro Moldova Hostel is an experienced hostel opened to provide comfortable and safe stay for travelers in Chisinau. The Hostel is ideally located in the city center. It is a 4-minute walk from the major attractions such as the Cathedral and the Central Park. Retro is a small and cozy Hostel composed of 2 dorm rooms, 1 private room and two common areas. We also offer free breakfast, coffee and tea all day long. There is a well-equipped kitchen at guests' disposal. We also refreshments for those who want to relax on our comfy balcony next to the aquarium in the evening or in the underground Bunker that gives you an image of 'good-old' Soviet times and cool you in hot summer nights. You can enjoy 24-hour hot showers that you might have problems finding in other places. Retro also offer tours to Orheiul Vechi,Transnistria and other destinations. The friendly reception will always provide all necessary information you need to travel to neighboring countries. The main bars, clubs, and grocery shops are all located within very short-walking distance from the Hostel. Friendly, English-speaking staff is ready to assist you 24/7.